Anyone who has not yet read J K Rowling’s novels for adults should be persuaded to try this London Detective series. After the promising Casual Vacancy, she hit her straps with the Cormorant Strike series, which just keeps improving. 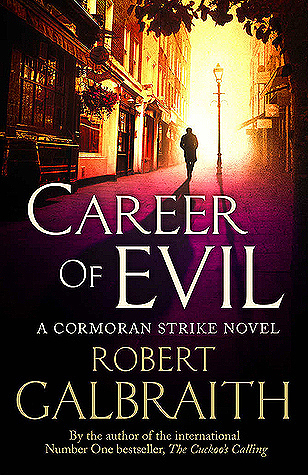 In Career or Evil, the third novel in the series, our protagonist struggles to make a living as a detective, after leaving the army when a mine explosion claimed his leg. Strike works with his long-suffering secretary Robin, who also struggles with her fiance’s jealousy over her devotion to her boss. This time, the murderer is much closer at hand and has ties going back years in a tangled past with Strike himself. As he pursues his hunch, Strike gets side tracked by all manner of odd and dangerous people, including the writers of a website that proposes Strike self-mutilated himself to escape the war. On this particular website, they admire him for it and hope to emulate his ‘choice’. The scene where Strike and Robin meet the website bloggers is shocking and memorable, and raises all kinds of questions about the needs and motivations of those who self-harm. The novel proves Rowling has well and truly joined the ranks of respected adult authors.